Okay so I know I have been slacking on the kids cooks ideas, but let’s face it, sometimes life just gets in the way . 😉 Lately I have just been letting Babs help me cook our breakfast. We did make super cute mini pumpkins for a Halloween party we went to last weekend. I saw a picture of them online and I wish the website would have been listed so I could give them credit for the idea. 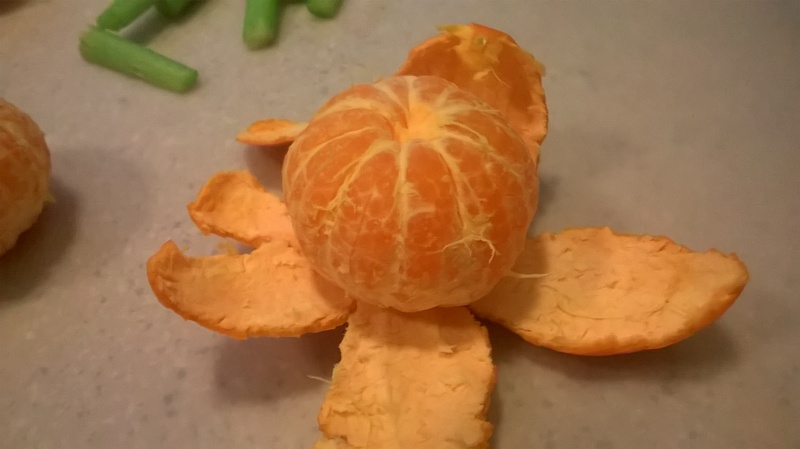 The first thing we did was peel the oranges. This really tests those fine motor skills. I start one for Babs like the picture to the right. However, if you have smaller child that would like to help you could also do most of the peeling and let them just pull the peels off like the picture below. 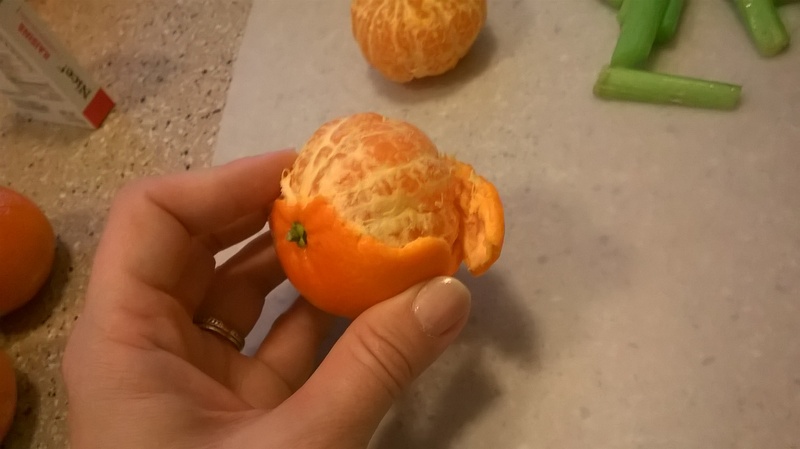 After we peeled the oranges I made a small hole in the top middle part of the orange. This is where the kiddos will put the celery which acts as the stem for the pumpkin. I cut each celery stick into 4 pieces. So how much celery you will need will depend on how many pumpkins you plan on making. It’s as easy as that! 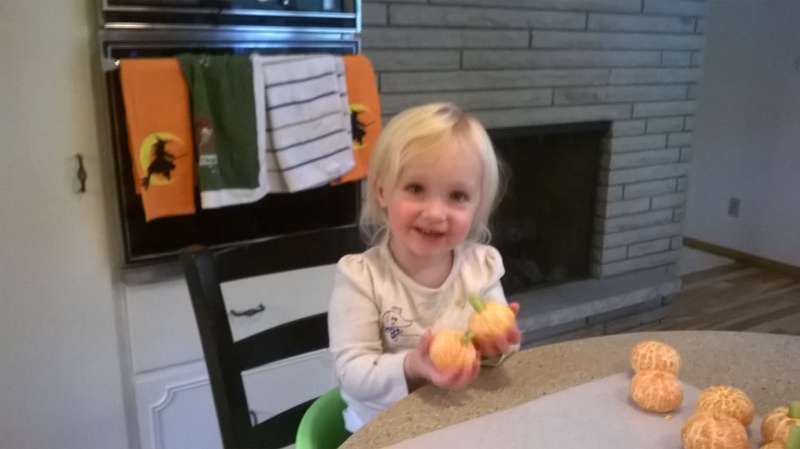 You have your mini pumpkins! 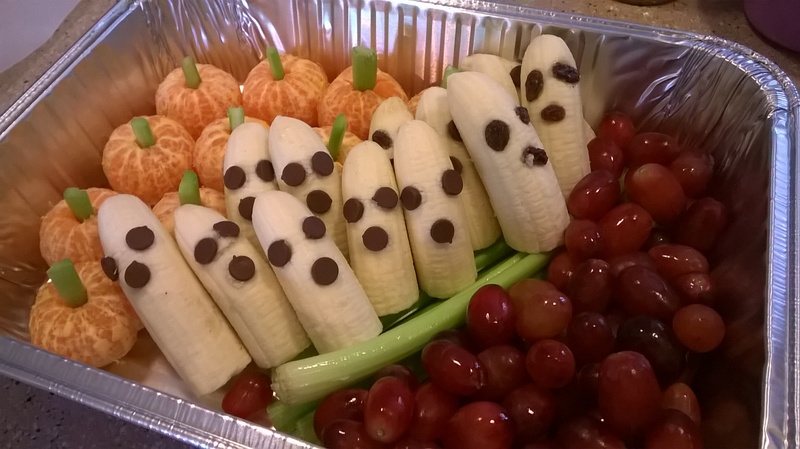 We also made banana ghost to go with them. I used the celery and grapes to keep them standing upright. They were a huge hit at the party! Here is the recipe page for Mini Pumpkins! Enter your email address to follow Tiny Hands Big Ideas and get new activities and life hacks delivered right to your inbox.